You can buy the eBook directly from our webshop or you could read the reviews below first. Shortly after we first officially released our eBook “From Basics to Fine Art – B&W Photography – Architecture and Beyond”, written by yours truly and my co-author Julia Anna Gospodarou that you can buy here , reviews started to come in, some collected from emails, others from social media posts and there were a few that were written as a foreword for the book. You can find a few of them below and more will be added once they come in. I have now finished reading the book from beginning to end. For anyone who is both passionate and willing to understand what Fine Art Black and White Photography is all about, this book in an absolute must buy in my opinion. The way in which both Joel and Julia explain everything is easy to follow and with great detail. Not only do they explain their personal vision but also share some of their secrets in what it takes to produce some of the best Fine Art Architecture images around today. I have been making Black and White photographs for a few years and I have learnt so much from these two photographers especially as they explain how to approach architecture, understanding the light and reaching out for a better composition. If architecture is not your thing but long exposure photography in general is, Joel and Julia explain everything there is to know about the subject including some of the pitfalls to watch out for. All in all, this is the one book which i will reach for time and time again for both interesting reading and also as a great reference source. – Ian Barber, Black and white fine art photographer and instructor on Facebook. From Basics to Fine Art gives an extended inside look on what goes behind the portfolio of these two top photographers, Julia Anna Gospodarou and Joel Tjintjelaar. The book provides answers to all the questions that may arise for everyone exercising this very exquisite form of fine-art photography, and even more, this book is “THE” necessary reference. It is written to share knowledge, vision, experience, tips and tricks, to inspire and so much more. Without any doubt it is the most complete book ever published on this subject. 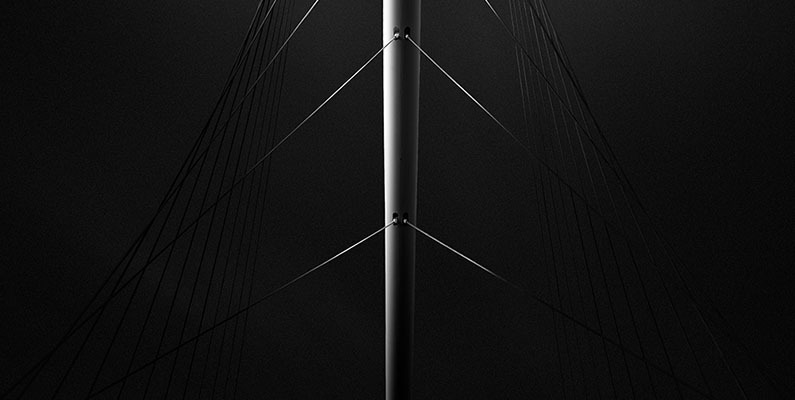 Joel Tjintjelaar is a B&W fine art photographer from the Netherlands specializing in LE and architectural photography. He has won several international photography awards, he was featured by NIK/Google software Silver Efex Pro 2 in their advertisement campaign, and he has recently released, together with Formatt-Hitech a signature edition IRDN filter set carrying his name and signature. Julia Anna Gospodarou is a well-accomplished architect who collaborated with famous names in the international architectural world and is an international awarded B&W fine art photographer with high distinctions in the most important photography competitions worldwide. Julia lives in Athens but considers herself a global citizen. The first part is very intense and a must read for every photographer, fine art or not. The topics you can find inside include how to develop a personal vision, what is the theory behind vision and presents a guide on how to get there. Julia writes about the well-know German philosopher Arthur Schopenhauer and she says: “The world is a dream, the world is an image. So the world is unique for each of us and in our interpretation”. Furthermore, Joel and Julia refer to Alfred Stieglitz concept of Equivalents. Referring to vision, Joel says: “It is not what you capture that matters, it is how you interpret it that matters and will elevate it from a snapshot to a work of art” Both authors will provide you with hands-on tips on how to find your vision. The second part of the book is speaks about all the technical, practical and post-processing tools that one must know. I have to say the subject is covered in a very complete way. Everything is there! *Composition and light: If the composition is bad, there is no way that the image can be saved… Study the old masters to learn about the use of light…. Simple means beautiful…. Learn all the (composition) rules, study all the examples, listen to all the advice, then do it your way! *Photography drawing ! : The method of Photography Drawing (Phtd) is related to how to shape volumes by using light as a tool. It is how to process and render an image the way you would draw it in black pencil. *Rules of gray ! : “there is just one color in B&W photography and that is gray: 10 rules of B&W photography that everybody should know. * Emotional abstract is all about capturing the emotional soul of the building. To do so, you have to understand the architect and building in front of you! * Guidelines for cityscapes and skyline photography, night photography and the setting tips for all these styles of architectural photography. * A very interesting section is the one about “subjects in Architectural street photography” which is a genre on its own. Here the authors discuss human presence vs the person as a subject n architectural Street photography, this being the main difference with the classical street photography which is more assertive as opposed to this one, which is more contemplative and reflective. * Additional topics include HDR, Infra red and also all technical aspects and principles of LE photography. * It also includes the fully detailed iSGM technique developed by Joel. * There is also an important and very detailed chapter in this book explaining how to use a T/S lens in a correct way. * The book shows also an insight into the processing workflow Julia and Joel are using in their award winning photos. As a conclusion, I can say that this work is probably the most complete work produced on this form of art. It is done by 2 of the finest B&W LE photographers of today. It is also written in an “easy to read” structure. I highly recommend this work for everyone who wants to go the next level with their B&W photography. I have slowly worked my way through to Chapter 8, composition. This book needs to be taken a bit at a time, like having a long slow meal with the finest of food. It will be several weeks yet before I complete the first reading, but so far, all I can say is that this is the greatest book on photography to come out since Bruce Barnbaum’s Art of Photography. I can see myself referring back to your book again and again upon whatever photographic journey I embark upon in the coming years. Having just completed a body of work in decay in machinery over a few years, it’s now time to move on “to fresh fields and pastures new”. I haven’t read the whole book yet, but let me say, it is the best book I ever read about B&W photography and especially about architecture and art. The book transports your spirit and I feel your passion. Thank you very, very much for sharing. I learned a lot. If you want to read it to convince yourself, then you can purchase the book on our web store. I am a huge fan of Fine Art Black and White Landscape Photography and have read every page on your website, unfortunately I am not in a position to be able to purchase any of your products ( I only wish that I was) . I have recently subscribed to your email newsletter. I try to emulate what you achieve with the Lee 100mm Filter System. At the moment I am planning and researching LE of Lakes and Mountains of which should produce some quite dramatic images for the right time of the year. I do not have any issues with the products or software that you use and sell, my only issue is that an accumulation of these items can be very costly, I use Ps but am unable to afford all these plug-ins unfortunately so I guess that I will just have to keep looking at your images for inspiration, and hope that one day I may be in a position to be able to purchase your products and software. I look forward to receiving your newsletters, A great website and full of info.